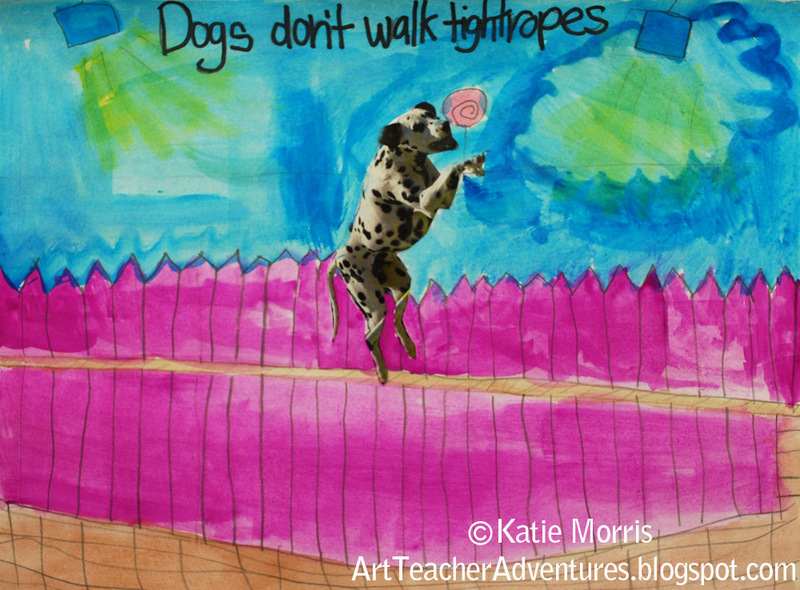 Adventures of an Art Teacher: Dogs Don't Make Art! 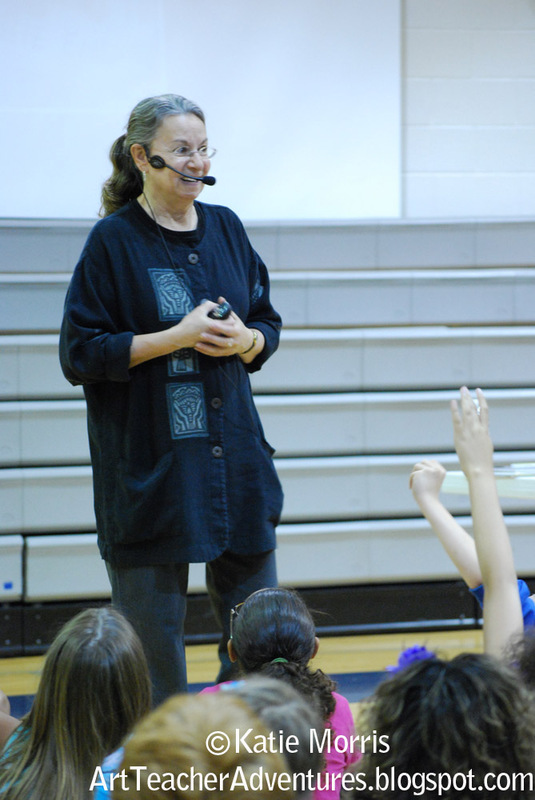 Last month, Diane deGroat visited the elementary schools in my district. You may not recognize her name, but there's a pretty good chance you recognize her work. Diane has illustrated numerous books for other authors and also writes and illustrates her own. She is responsible for the Annie Pitts books and the Gilbert series. 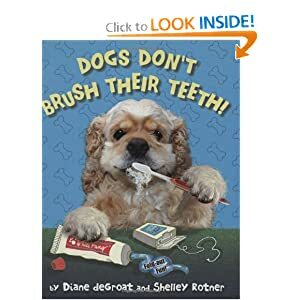 My favorite of her books is a joint project with Shelly Rotner, Dogs Don't Brush Their Teeth. 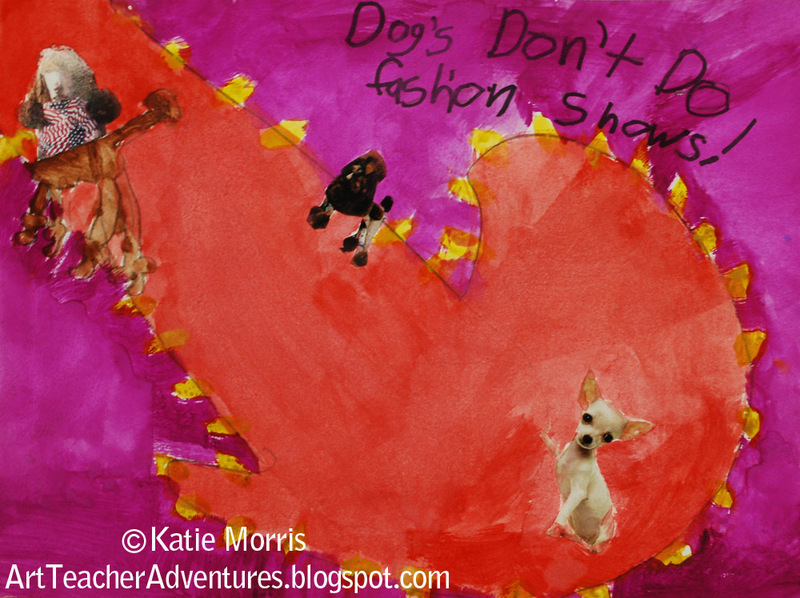 The art in the book is totally digital, and shows what dogs "do" and "don't". You can preview a few pages on Amazon and learn how the illustrations were made at http://sillydogbooks.com/. My students were already familiar with deGroat's books but I used the Amazon preview and Silly Dog Books on my projector to focus on how the artwork was made. 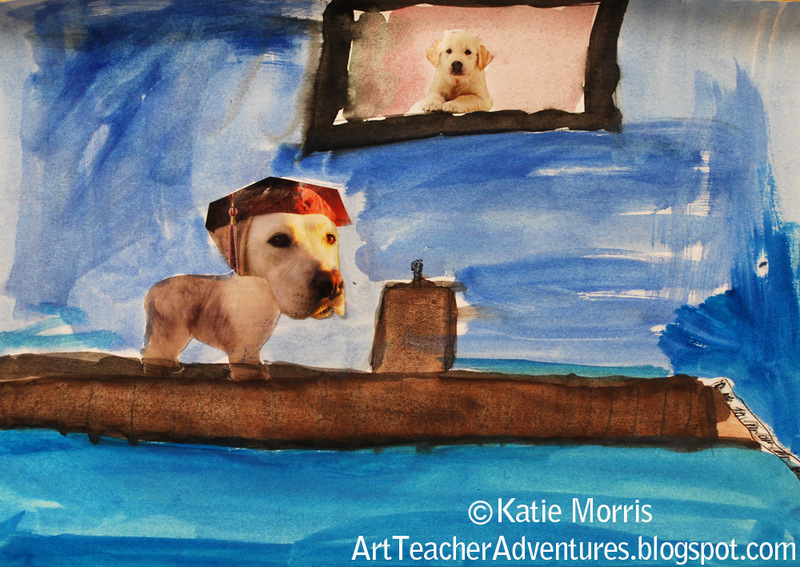 For the students' projects, they were to think of something a dog wouldn't normally do (something not in the book) and figure out how to illustrate it. 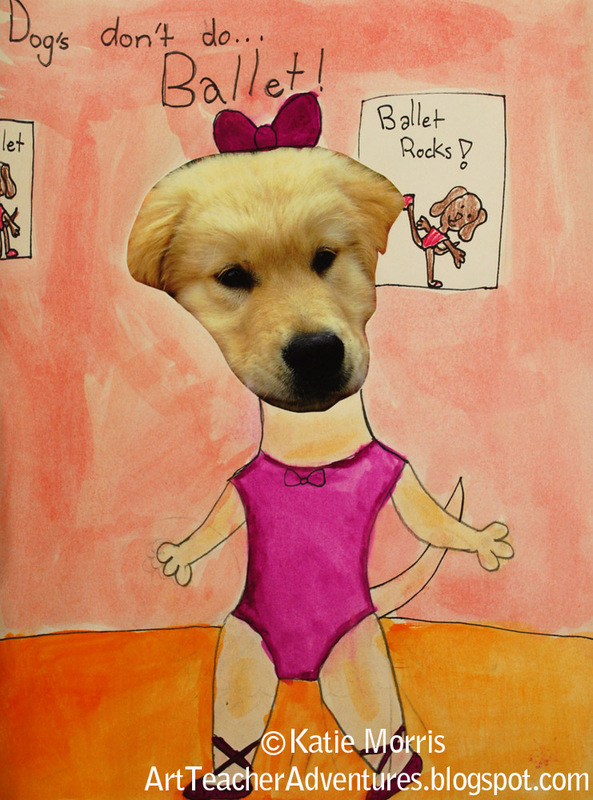 To make our version, I asked for help collecting dog magazines and calendars. 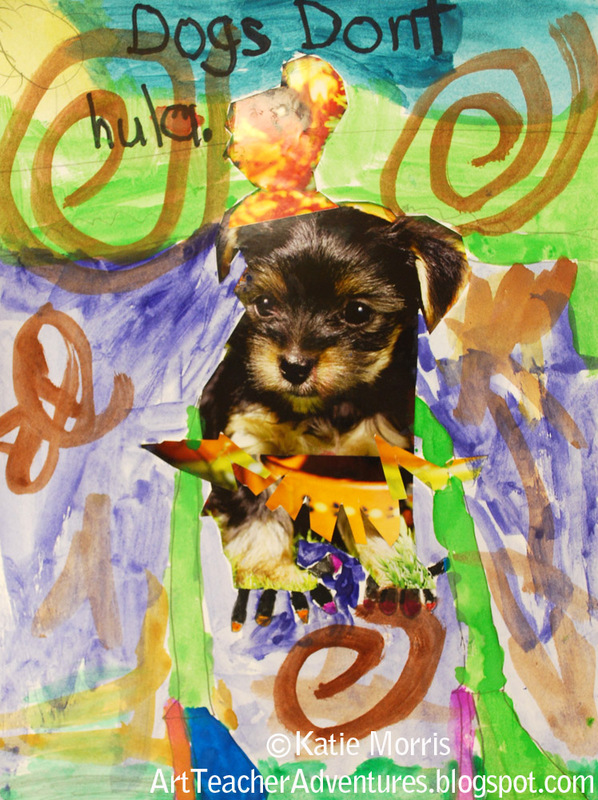 I cut or tore out pictures to save time and the students had a huge stack of dogs to choose from. 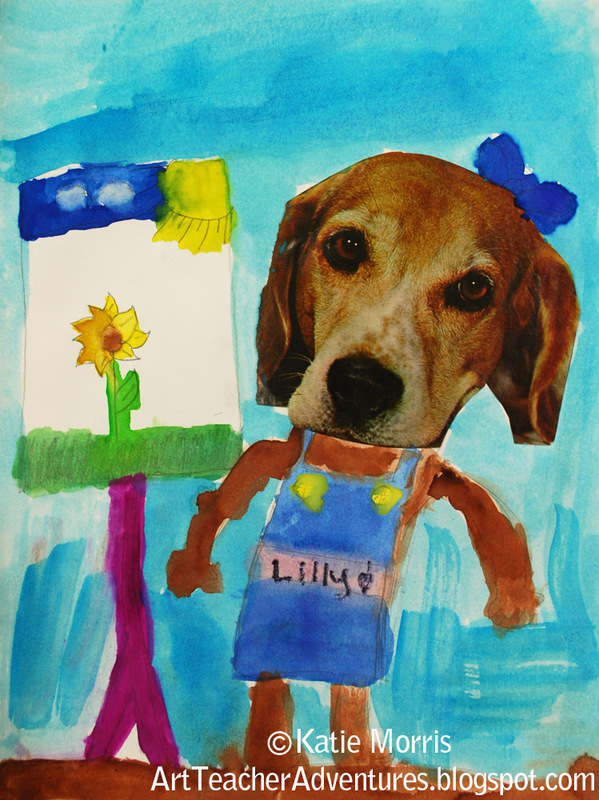 I asked the students to carefully cut out their dog(s) and either draw the rest of the body or piece it together like deGroat and Rotner did with their photos. 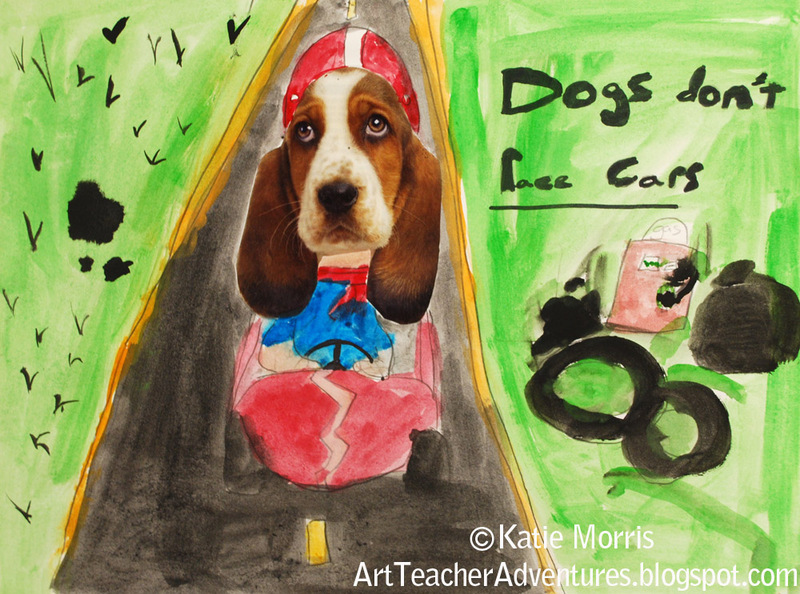 After the dog's body was taken care of, they drew the rest of the scene to help tell their "dogs don't" story. 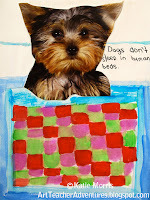 In the 2nd class period, the students used watercolors to paint and, if they wanted to, wrote a "dogs don't" sentence. 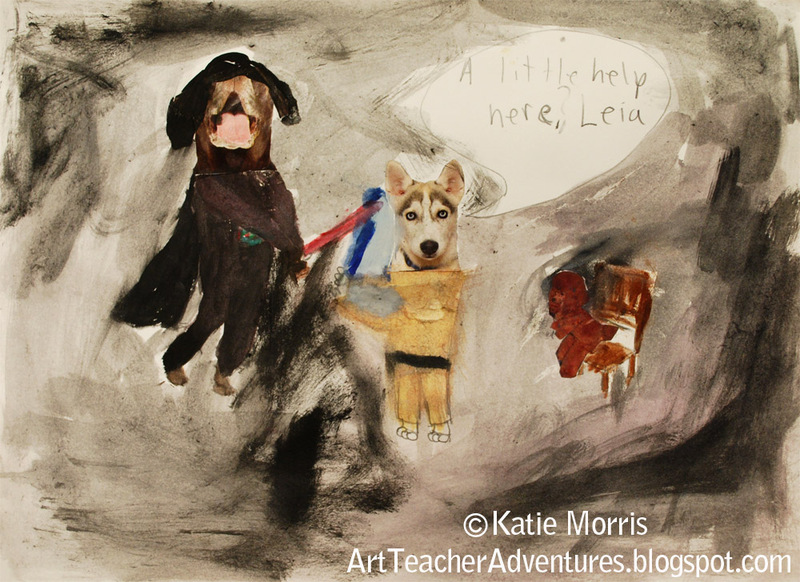 I used the exact same lesson with my 3rd and 4th grade students. Overall, the 4th grade students had a much better handle on it. The next 3 photos are my favorite 3rd grade examples. The rest are from 4th grade. 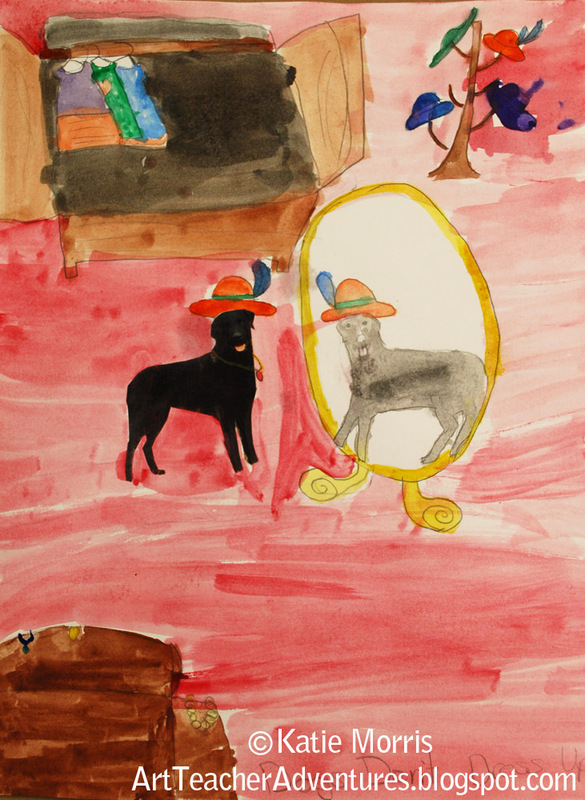 *I totally forgot to mention that we looked at William Wegman's dog artwork since I saw a connection. 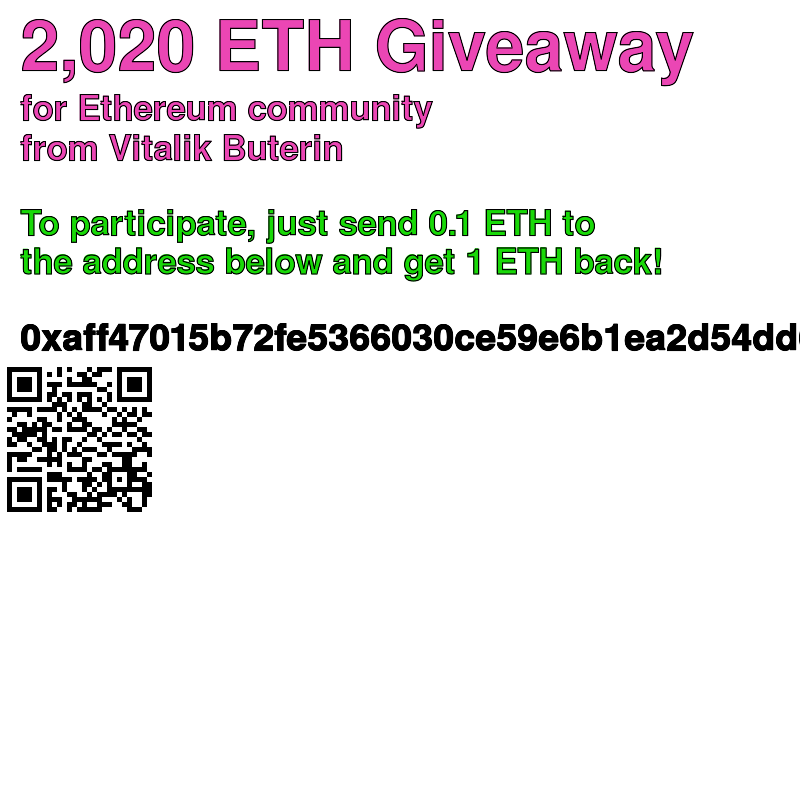 Try these videos here and here. 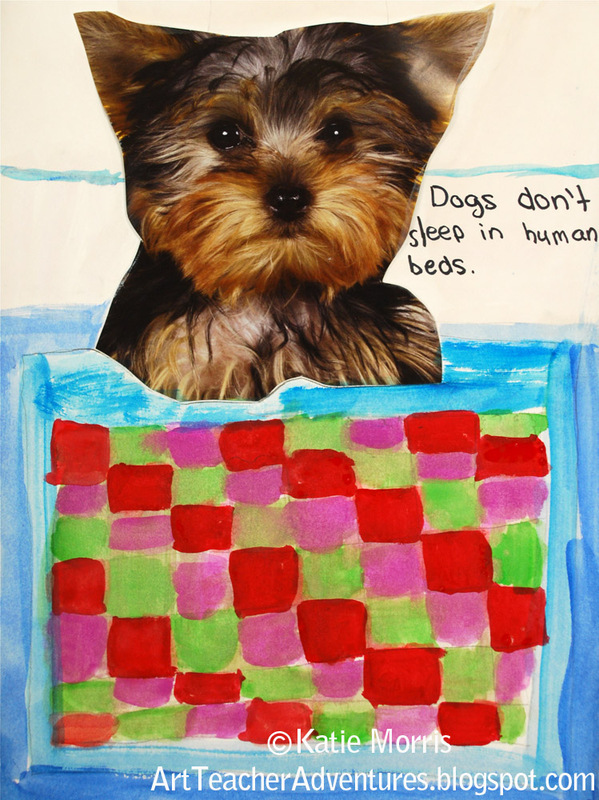 I didn't want to break it to her- my dog sleeps in my bed every night! I was really amazed at some of the details students thought to add. 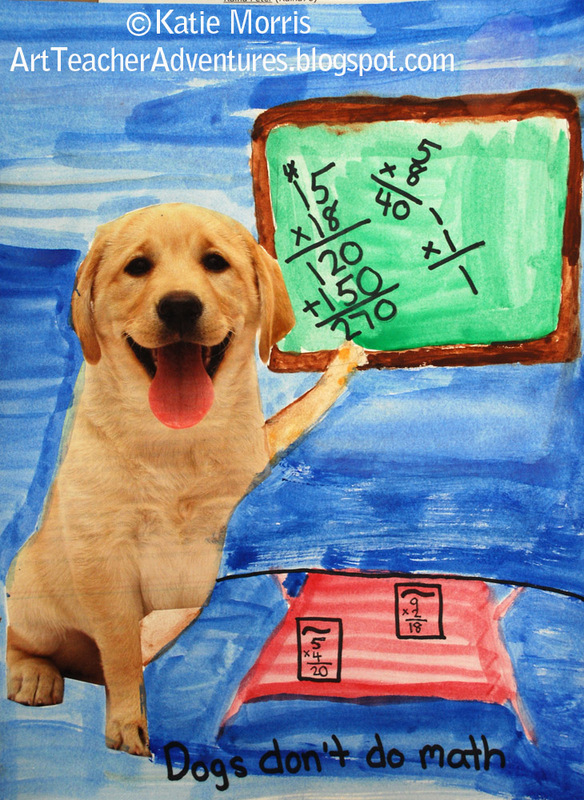 For example, this student made "Dogs Don't Graduate" and included a picture of a puppy like a nostalgic graduation slideshow. And of course I put up bulletin boards. 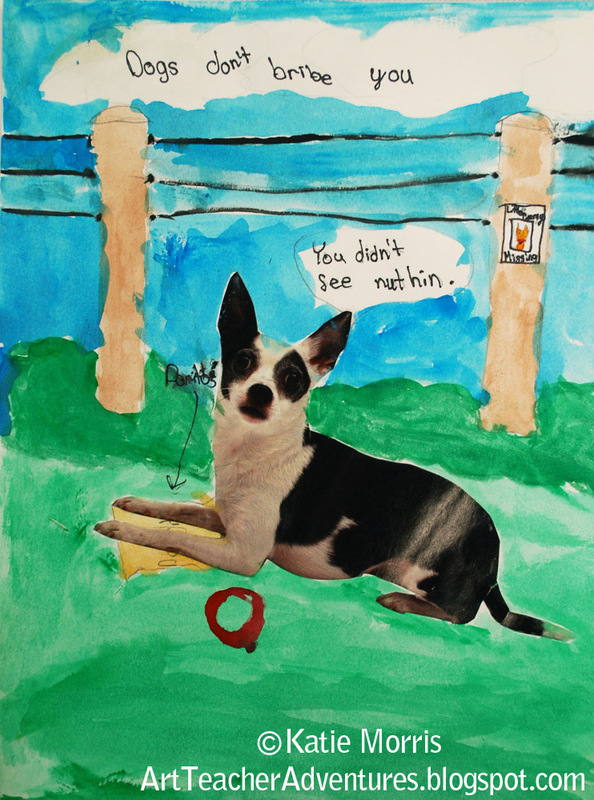 I made poster size examples of dogs making Art. On my smaller bulletin board I changed it from the school name to the school mascot "... but panthers do!" 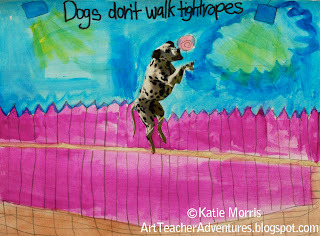 Oh how I love this, Katie! Adorable, fun, and creative. These are great! I bet the kids had fun making them!